Recurring prison fires do not let us forget about our prisoners. We were reminded of them again thanks to a recent prison fire in the Urfa E-Type Prison. It was a prison with a total capacity of 350 beds, but 1,057 prisoners were confined in the prison. Combined with the summer heat peculiar to that region, this overpopulation created very inhuman conditions for the prisoners. The Chair of the Urfa Barr Association İrfan Güven once wrote: “In Urfa Prison the conditions are so inhumane that they qualify as torture. There is a severe neglect of duty. Even animals cannot survive in this prison in the hot weather of Urfa.” Each prison ward was only suitable for 10 people, but the prison administration put 20 to 30 prisoners in every ward, making the conditions more unbearable. The prisoners had even started to sleep in shifts because there were not enough beds for them. On June 16th, 2012 one of the wards started to burn. There were 18 people inside. Again the prison guards did not open the door to extinguish the fire. Result: 13 prisoners suffocated to death in smoke. What is actually going on behind the bars, despite all the talk of democratization and demilitarization in Turkey? 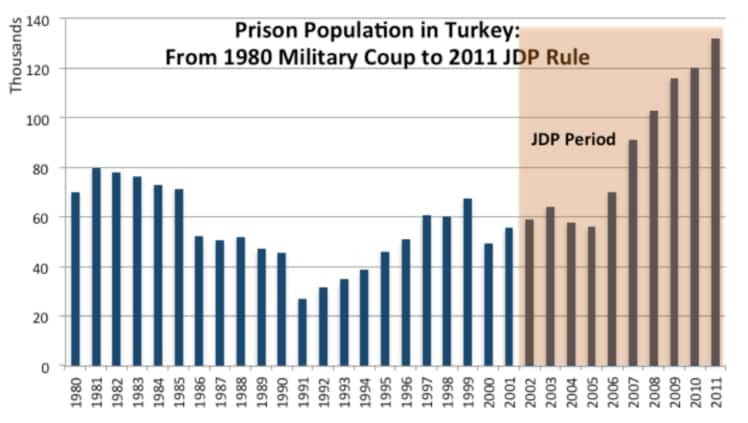 Why is the prison population now double that of the September 1980 military coup period? When the ruling Justice and Development Party (AKP) came to power in 2002, there were 59,429 prisoners in Turkey. In just six years, the AKP nearly doubled the prison population to 103,000, which rose to 132,000 in 2012, breaking a record in Turkey. What happened? If you just surf the Turkish and international corporate media, you might think that Turks have gone mad and suddenly started to commit more and more crimes while the Turkish government has been tirelessly bringing democracy and prosperity to the country. This sharp increase in the prison population caused some capacity problems as well. There are 377 prisons in Turkey with the capacity of 121,000. However, there are more than 132,000 in the prisons. This means that more than 10,000 people do not have proper places to live in. Behind this sharp increase, there is the AKP’s fear of the popular opposition as well as the economic crisis. The upward trend that began in 2006 is partly attributable to a series of amendments to the Anti-Terror Law of Turkey. With these amendments, anything from organizing or participating in demonstrations to demand democratic rights, shouting slogans, to dancing, wearing a piece of clothing, or making a telephone call might be labeled as “terrorism” or “terrorist propaganda,” and you can be arrested and prosecuted. The case of imprisoned students is an example of this AKP paranoia. The 10-year rule of the AKP introduced a new reality to the prisons of Turkey. I don’t know if we should be proud of it, but I can say that Turkey has the most educated political prisoners in the world. According to a report issued by the Solidarity Initiative for the Imprisoned Students, as of June 2012 there were 771 university students in the prisons of Turkey. Mehmet Karlı, a lecturer at the Faculty of Law of Galatasaray University, says that “the majority of these students are arrested because of the allegations of ‘carrying out actions on behalf of a terrorist organization without being a member of it. '” I can picture you imagining evildoers in ski masks killing innocent people “on behalf of a terrorist organization,” but, no, that is not the case. The majority of these students are arrested because of their demands for democracy and social justice and — believe or not — for wearing a wrong vest, a wrong scarf, and the like. We have identified that you participated in a press event behind a banner which said “Democratic Activities Are Not Crime, We Will Continue to Stand by Our Associations and the Freedom of Association — Popular Front” and we have observed that you shouted the slogans “We Are Right and We Will Win. We Will Defeat the Conspiracies. Down with Fascism, Long Live Our Organized Struggle” in order to shape public opinion. Write down your defense. We have identified that, together with the suspects near you, you have organized a poetry reading and a slide show called “8th of March World Women’s Day.” Write down your defense. We have identified that you have participated in the press event that was organized by the “Education Workers’ Union,” Hatay Branch, to protest the “Legal Amendments to the Educational System” on 03.03.2012. Together with the group that participated in the press event, you shouted the slogans “Say No to Reactionary Education, Say No to Reactionary Fascist Education. Free Education, Free Health Services. Scientific, Democratic Education in Mother Tongue.” Make your statement. The list of questions goes on and on. What this reveals is the AKP’s brutal attempt to crack down on the popular opposition by creating an atmosphere where every protest against the government becomes a terrorist act. But that is not all. The most outrageous is the case of imprisoned children who witness and experience the most relentless torture at the hands of the ruling power in Turkey. It is impossible to present an exhaustive catalogue of miracles of democracy under the AKP, but the case of child prisoners is of great importance as it shows the depth of the swamp that the ruling party has managed to create in prisons. According to the information provided by the Ministry of Justice, in 2005, before the operations against the Kurdish organizations started, 17 children were arrested because of political allegations. In 2006, 2007, and 2008, the numbers of child political prisoners became 14, 47, and 36 respectively. By 2009, the political arrests of children had begun to escalate: The police under AKP arrested 1,105 children in 2009 and 1,023 children in 2010. In October 2011, the number of such children in the prisons reached 2,021, which rose yet higher to 2,360 in April 2012, said the Minister of Justice, in his reply to a parliamentary question raised by an MP of the Peace and Democracy Party. One final note on this issue: the journalist, Özlem Ağuş, who uncovered the atrocities against children was arrested in March, two weeks after her report was published. According to the international media giants, Turkey is playing for regional leadership by becoming a model of democracy in the Middle East. But this is a democracy only for international capitalists, their bureaucrats, and their generals. Not for the people. Not for students. Not for laborers or unionists. Not for women. Not for Kurds, Alevis, or even Turks. AKP representatives have declared that they will build 196 more prisons for the peoples of Turkey. Expect yet more media plaudits for democracy AKP style. * Data for this graph is compiled from Prison Statistics 2010 of Turkish Statistics Institute, Turkish Penitentiary Institution Web site, and from Milliyet, Sabah, Vatan, and Haber7 newspapers. Eren Buğlalılar may be contacted at <tolstoyevski@gmail.com>. Low-Wage Workers March in New York — Will It Make a Difference?